Gibbons are the smallest member of the ape family. They live in family groups in which the male and female are socially equal. Gibbons vary in colour but colour is not related to gender. They stay high in the forest canopy and do not venture to the ground. Gibbons get most of the water they require from the fruit they eat. This is supplemented with water they find in tree cavities and by licking the dew on their fur. Gibbons move by brachiating, or swinging from branch to branch by their arms. You may hear the gibbons "singing" a duet. This singing maintains the pair bond and defines their territory to other gibbons. Because of amplifying throat sacs, their call can be heard up to 1 km away. They are most threatened by the illegal pet trade. 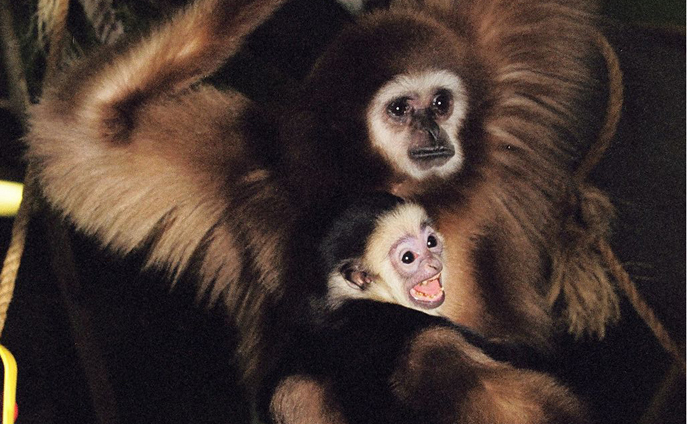 To abduct 1 baby, up to 10 other gibbons may be killed.